Ive been doing loads of research but tips on making sure his move to mine is as stress free as possible and do's and dont's are very much appreciated. I can imagine how excited you are at getting Frankie. Has he had another owner before he went to the shop and do you know his history? 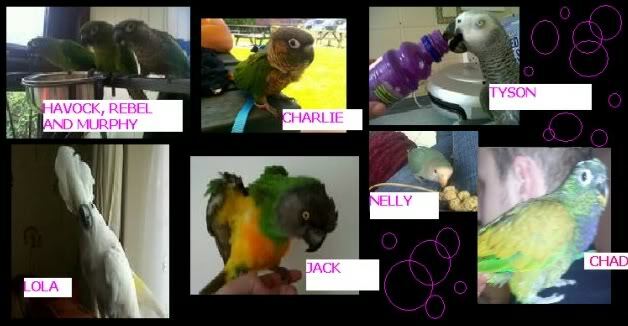 I haven't a Grey these days but do have other parrots, but there's many members on this forum with Greys so I am sure they will give you tips. I always found Greys more sensitive than some of the other parrots. And do ask any questions, everyone will try and help. It`s great that you`ve already got to know the bird too. Someone described Greys as a bit like Autistic children which I thought was actually quite good. From what I know they don`t easily take to change, they like smaller cages rather than large (though not too small) must have a low sunflower diet, prone to fatty liver, and new toys should be introduced gradually. So pleased he is finally coming home, and welcome to the forum! Scarlett wrote: Oooh how exciting. Im gonna b putting his toys that r in his cage at the pet shop into his new one at my house so he's got lots of familiar surroundings which should ease his move. he's going to be moving into a corner cage that is about 6ft high and over 2ft in depth and 3ft width. It also has a perch on-top which he's going to have access to a lot as there's always people home. baby greys are gorgeous! Why have you clipped babies wings? Is there a really good reason for this? I'm not trying to scare you off or tell you off, it sounds as though you think it's the norm? Is that right? Your grey sounds as though he's quite good with people, give him a big cuddle, keep cuddling, keep talking to him and make sure he's not going to fall off anywhere and hurt himself........and when they do grow back.......please, please, don't clip him ever again....he's a bird, please let him fly. There was a very good reason for it and it wasn't my choice as it was my boss who has much experience with parrots who decided that he needed to b clipped for his own safety as the pet shop i work in is joint to a garden centre and with constantly opening automatic doors it would have meant him never being able to come out of his cage. He started doing stereotypical behavior i.e repeatedly climbing around in circles and scratching the top of the cage constantly. it reminded me of a pacing tiger in a zoo. Since having his wings clipped and being able to get him out he stopped "pacing" and seemed happier. But i do agree with you that they need to fly so once im able to bring him home im going to look into harness training so that he can still have freedom. and a big welcome to you too! Me personally, think your boss needs shooting to clip a baby. (think she needs to get reading up on wing clipping, the whys and wherefores of not clipping on so young). I have two greys, they are so very entertaining, you'll never be bored with a grey, are you going to provide an outdoor area for Frankie? hi and welcome too! it will be fantastic for him to be out of the pet shop, glad he has a home, love to see pics of him !! Im just waiting for the cage i have brought for him to turn up. As the one he's is is the wrong shape to fit in the house. Ive gone for a big corner one. it should arrive between now and thursday. im getting so impatient waiting for it to turn up because i cant wait to get my lil Frankie home. Ive been visiting him every day and he always calls me back when I leave. :') The garden i have wont allow for an outdoor area but like i said. Im deffinatly going to look into harness training so i wont have to clip him again. Good for you, and hurry up and get him out of there! Borrow a cage and take him home! Fingers crossed ir arrives sooner than later. Hi P-T-Sweetie, welcome to the gang. It was lovely to read how you fell in love with Frankie and have been saving your money to buy him, well done you. It's great your family have met him and like him too. Mind you, who couldn't fall in love with a baby grey I wish you a long and magical life together, and am so looking forward to hearing all about him coming home. We all are, and will be here to support you if you need any help and advice along the way.